There over 38,000 special district government agencies in the United States — that’s nearly half of all local government entities in the nation. Yet, until now, they’ve lacked a dedicated forum to share ideas, build relationships and solve common problems. This report details the inaugural year of a new program to recognize and support special districts. The national initiative, an AT&T program with Government Technology, aims to build a community where special districts can connect and collaborate on the issues that matter to them most. 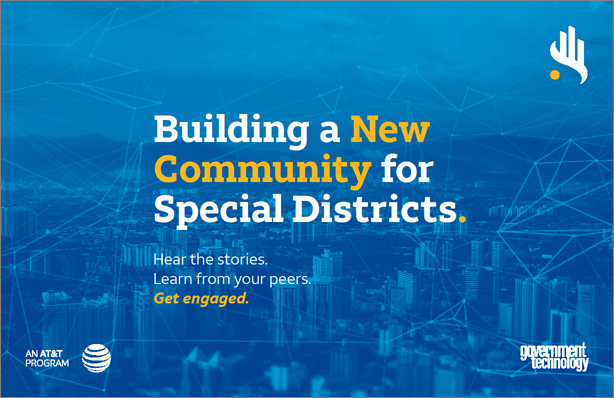 Download this report now to learn what forces are reshaping special districts’ technology needs, read case studies that show how innovators in this space are responding, and obtain valuable advice on how to navigate successful transformation now and in the future.